Some places in California are great anytime, but these are especially nice to visit during the Spring. In the Golden State, that means in March, April, and May. During the spring season, you can see some gorgeous wildflowers and catch Yosemite's waterfalls at their best. You can visit a few places that are going to get too crowded in the summer - and you could even take in a meteor shower. In spring, expect some of the year's best weather. It will still be clear at the coast and not unbearably hot in the desert yet. Mountain passes may still be closed because of snow, limiting the places you can cross them. The ski resorts will be hoping for it to linger, and if it does, late spring skiing can be fun. You can get more details about other seasons in these guides to California summer getaways, find places to go in California in the fall, and plan a winter getaway in California. Hearst Castle is open year round, but in the spring, they host special evening tours. Visitors get a chance to see the castle lit up as if for a big, fancy party. Docents dress in period costume and pose as guests. Those tours are the best way to see the castle looking like it might have when Mr. Hearst lived there. If you feel like a quick trip to Palm Springs but don't like 100-plus-degree weather, go in the spring, or you'll be waiting for a long time for it to cool down. For most people, it gets too hot by June, and it won't cool down again until November. Weather is gorgeous in the spring, with sunny skies and warm days. Except for spring break, it's less busy than in the middle of the winter. And in a perfect year, you might even catch the wildflowers blooming in the desert nearby. Spring is one of the best times to go to San Francisco. In fact, it's perhaps the best time to go during the entire year. By March or April, winter rains will be over, and San Francisco's legendary fog won't roll in for another month or two. The weather will be lovely, with blue skies and comfortable temperatures. Tourist spots are less crowded than in the summer, too. That makes it easier to get around and gives you more room to enjoy them. ©2005 Betsy Malloy Photography. Used by Permission. Very few people know about the Valley of the Oaks. In part, that's because it's a made-up name for the area. But even if you say you're going to Jolon or Fort Hunter Liggett or Mission San Antonio de Padua," — or even William Randolph Hearst's Ranch, few people will know what you're talking about. That's too bad because this remote and little-visited valley near King City has a romantic-looking old Spanish mission and Mr. Hearst's ranch house (which is now a hotel). And it also boasts some great wildflower displays which reach their peak in the spring. Yosemite is glorious the spring. In fact, it's gorgeous any time of year, but especially when the high Sierra snowpack starts melting and Yosemite's waterfalls put on their best show. In a wet year, you can hear the roar of Yosemite Falls all over the valley. The gorgeous mountain dogwood trees bloom then, too but you don't overlook these other great things to do in Yosemite in the spring. And you can get there before the place gets packed with summer crowds. Anza-Borrego Desert State Park south of Palm Springs is one of California's top places to see the desert in bloom. Their peak season stars in January or February and lasts through March or April. Your best bet to catch the flowers at their peak is to check their website or call the wildflower hotline at 760-767-4684. 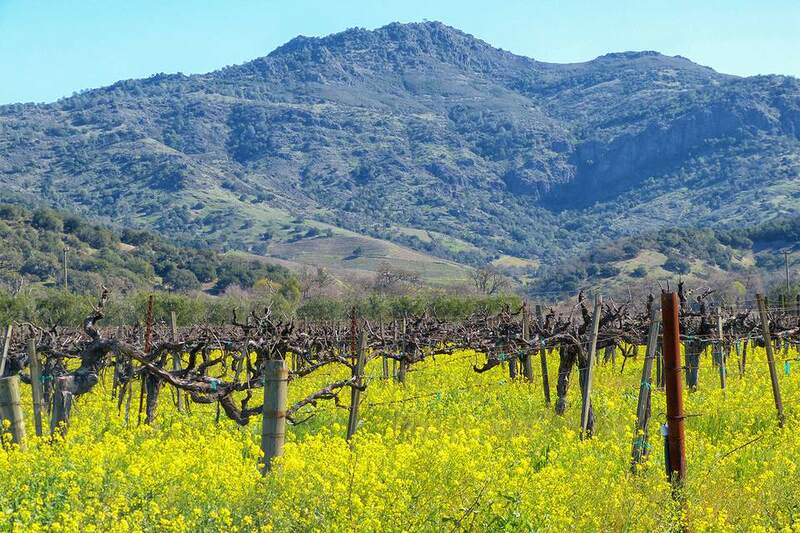 Napa Valley is fun to visit in the spring before it gets overrun with summer visitors. You can enjoy food and music festivals, take photos of the blooming yellow mustard, or test your fitness by running a marathon. A meteor shower is a little bit like Mother Nature's fireworks. It happens when the earth passes through a lot of space debris. The meteors form when those rocks from outer space burn up while passing through the atmosphere. The Lyrids meteor shower occurs in mid-April. It tends to come in a burst and usually lasts for less than a day, which makes it uber-important to check the exact dates for this year. The brighter the moon is, the fewer of them you'll be able to see. To find out the moon's phase, use the website Sunrise Sunset. Some of the best places to see it are Death Valley, Big Sur, Mendocino, and locations along Scenic Highway 395.